As a content designer, it’s often hard to know how to best use the insights from discovery research. It can feel like a big leap to take a research finding and translate it into words on a page. This is where ‘cognitive walkthroughs’ come in. Cognitive walkthroughs are helpful for evaluating an existing product, or as a quick, low cost method of evaluating a product in development. During a cognitive walkthrough, a user researcher assesses a service or website against a known set of user goals. It’s a formalised way of imagining users’ thoughts and actions when they use your website or product for the first time. Whilst it doesn’t provide the same quality of insight as testing with real end users, it’s a great way of getting the most out of discovery research. And it can help to identify early usability issues and content gaps. On the import and export project we’re building a prototype to see if it’s possible to simplify the import/export guidance on GOV.UK by several orders of magnitude. We needed to do some work on the content before we could meaningfully test it with users. But we drew heavily on the ‘one government at the border’ discovery research to make sure we understood the user needs and created meaningful user journeys. 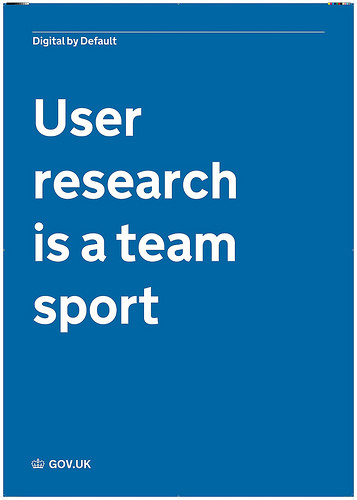 The user researchers studied the prototype according to the user goals and tasks that came out of their research. They analysed how certain popular tasks could be accomplished - identifying smaller actions along the way. We then reviewed the prototype together and walked through the tasks as a group. During the walkthrough, the user researchers took on the mental models and motivations of the research participants they’d met. They spoke aloud while they did this and tried to anticipate what users would understand and if they’d be able to complete particular goals. I’d never participated in an cognitive walkthrough before. I immediately saw the content differently. Walking through the tasks one tiny step at a time allowed me to see exactly where and when our content would fail to meet the needs of our users. In some areas, I learnt that the purpose of the content wasn’t just to describe a process for a user to follow, but to help them make a decision about whether to pay an agent or freight forwarder to something for them. We’ve created user stories to address the findings from the cognitive walkthrough and will update the prototype when we’re done. We want to fix some of these issues before we test with real users. We’ll be putting our prototype in front of real users in phase 2 of the project - more on that soon!